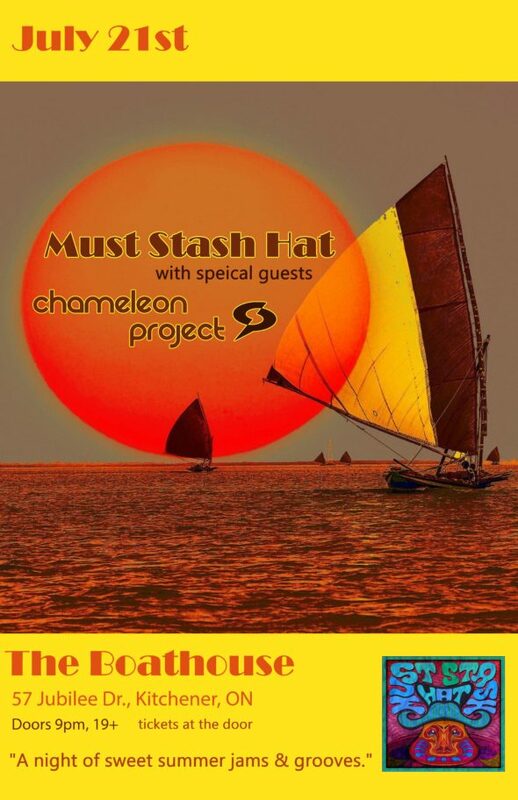 Must Stash Hat wityh special guest Chameleon Project in Kitchener at The Boathouse! One of the best venues around. A Must Stash Hat show feels like it lasts for days while you’re in it but when they end their last note, everyone is still screaming for ten more songs. Your body won’t stop moving while they transition from an upbeat rocking chorus into a jazzy and relaxing hypnotic refrain before stretching it out, twisting it up into outer space and verging ever so close to awkward before exploding back in a most satisfying cymbal ridden rhythm, bass slappin’ and bappin’ on the hips of high laughing guitar chords pulling at the off beats. Must Stash Hat is a three piece Toronto based jam band and the best way to see them is live and unshaven. Over 10 years of playing together, their talent for improvisation is powerful. These moustache men know each other too well to miss a beat. The Toronto-based livetronica phenom The Chameleon Project blurs the line between electronic and organic sounds to create a psychedelic dance party that stimulates the senses. Fusing elements of groove-based jazz, electroncia, funk, disco, dub, reggae, and experimental rock, the music is both intelligent and visceral. The music combines the authenticity of live music with the psyche of electronica, experimenting with unique timbres, otherworldly vocal samplings, and heavy, tight beats. Often compared to such disparate bands as Bonobo, Medeski Martin and Wood, STS9, John Scofield, Thievery Corporation, Soulive, and the Disco Biscuits, The Chameleon Project mixes elements of the past with modern innovations into a signature style that is full of infectious, syncopated grooves. Their shows are pulsating dance parties whose energy is contagious. This is music for your mind, and your body.